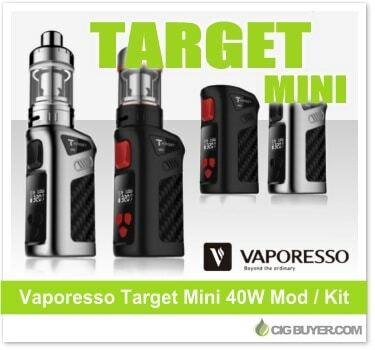 The Vaporesso Target Mini 40W Mod is a neat new device from Vaporesso that includes a huge range of features in a ultra compact package. Powered by a built-in 1400mAh battery, it offers up to 40W of output with temperature control and is sold alone – or as a kit. The kit comes with a 2ml Guardian Tank, which has a dual child locking mechanism and features Vaporesso’s CCELL ceramic coils, which are designed to last extremely long and provide outstanding flavor. It’s designed to be leak-free and comes with DL and MTL settings.